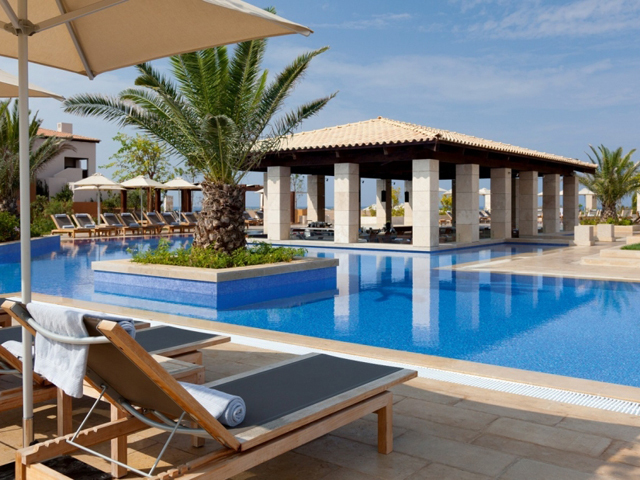 The Romanos, a Luxury Collection Resort, is an exceptional award-winning property stretching along the prime Mediterranean destination of Navarino Dunes at Costa Navarino. This is the perfect location for unrivaled relaxation within the 321 incomparable rooms, suites and villas of The Romanos Resort, offering exceptional garden, golf and sea views, and the iconic sunset backdrops of the Ionian Sea for an unforgettable experience..
With exceptional specialty treatments : The Anazoe Spa at Navarino Dunes offers a serene sanctuary, with an exceptional menu of specialty treatments based on ancient beauty practices, utilizing the area's exclusive natural ingredients and unique products. 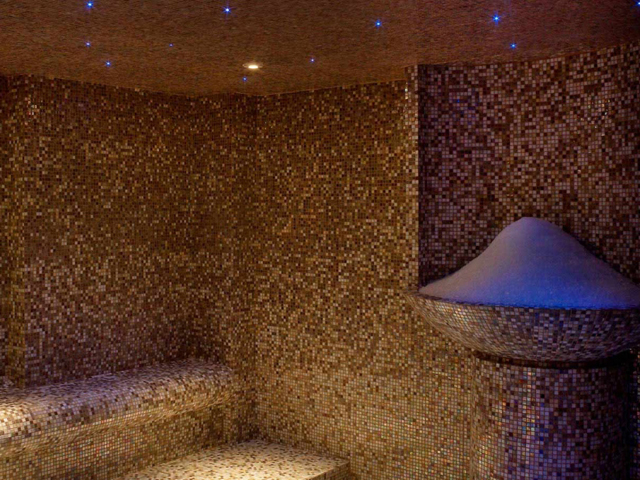 It has developed signature treatments based on the teachings of Hippocrates, the ‘father' of western medicine. 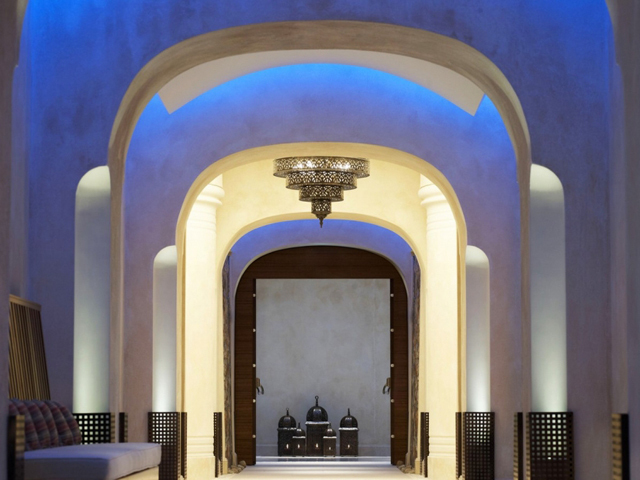 Therapists select the most appropriate and beneficial treatments tailored to meet your personal expectations and needs- right down to the sounds; a visit to Anazoe Spa also ensures an accompaniment of music based on ancient Greek melodies. Explore the unknown islets of Messinia : During half-day, one-day or two-day cruises, joined by experienced skippers and crew, guests can discover the crystal-clear waters and secrets of this crossroads of ancient civilizations, aboard the motor yacht Ferretti or the sailing boat Gib Sea 43. 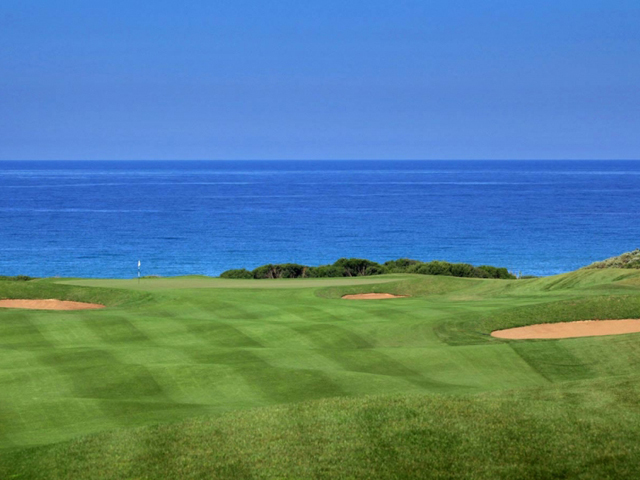 Discover the unspoiled countryside : The Navarino Outdoor Academy makes full use of the unspoiled countryside around Costa Navarino to offer a full suite of exciting sports and other recreational activities. Whether your idea of fun is hiking, mountain biking, or climbing, our experienced team of professionals will be on hand to provide any assistance needed. Indoor Climbing Wall : Welcome to Navarino Rocks, the Indoor Climbing Wall of Costa Navarino. The 100sqm-climbing wall offers a big number of climbing routes both for beginner and advanced levels. 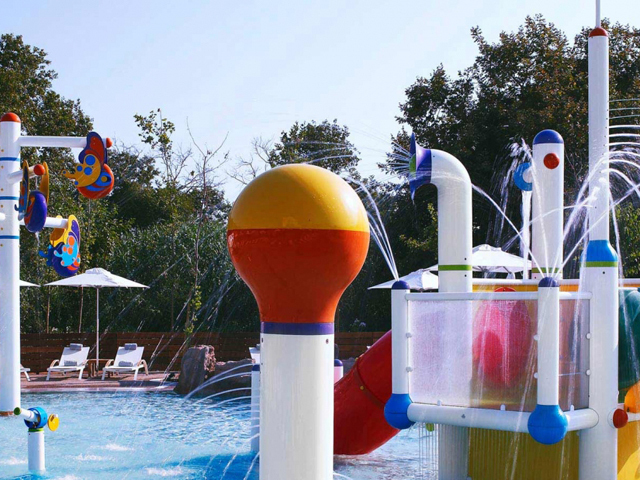 Professional instructing team, quality facility and fun atmosphere provide a safe, welcoming and encouraging environment to our guests – children & adults! 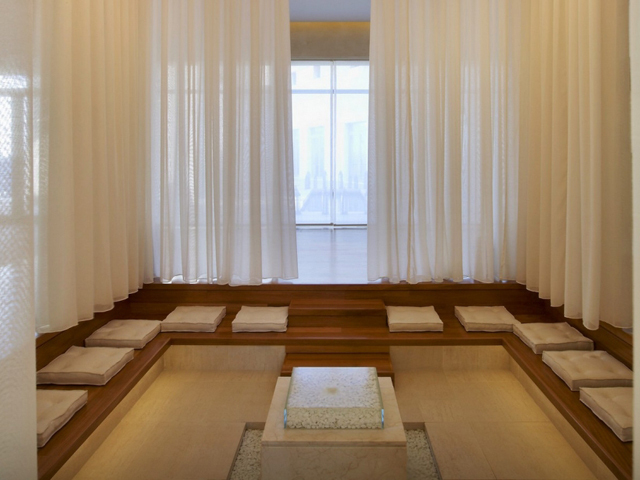 Mantain your training routine : Located on the lower level of the resort, our complimentary health club welcomes you with smooth wood floors bathed in sunlight. 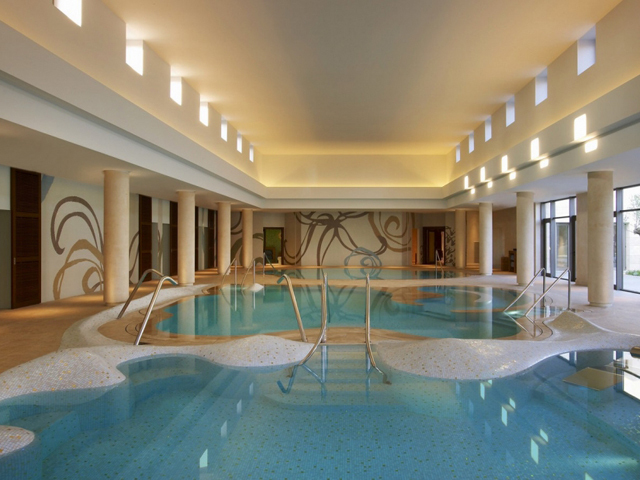 Facilities include two steam rooms, 18m indoor pool, whirlpool and locker rooms for winding down and freshening up after your efforts. 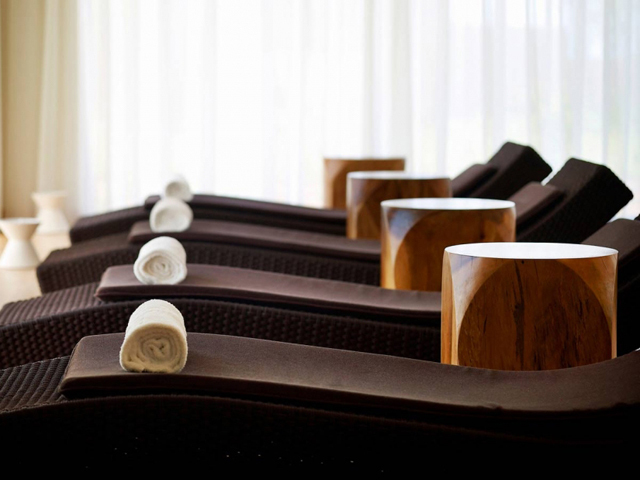 Take a relaxing run on a treadmill or take advantage of our top-of-the-line CYBEX weight machines and free weights. Additional equipment includes stationary bicycles and other cardio machines. 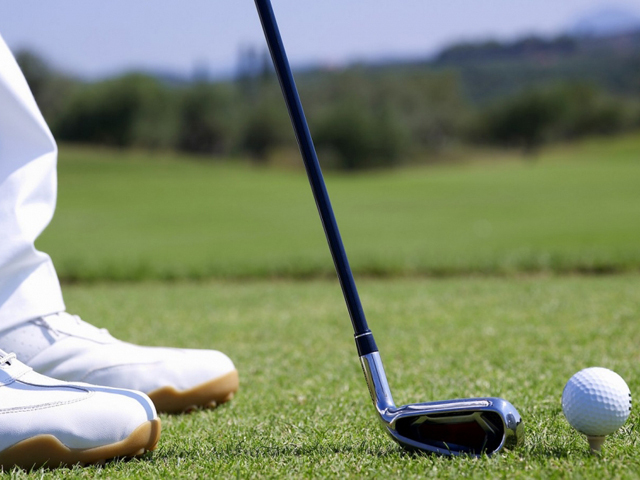 Developing golf in Greece : The goal of the Academy is to develop the game of golf in Greece, and provide professional golf tuition to players of every skill level. 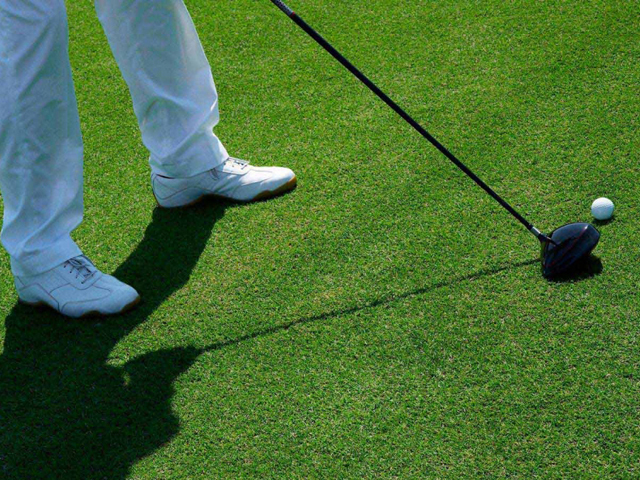 Extensive practice facilities are available to help golfers develop their game, including a well-appointed full-size Driving Range, Putting Green and Short-Game practice area. For children aged from 4 months to 3 years : Specially designed to cater to our youngest guests from 4 months to 3 years old, Cocoon offers a dedicated play area for you to enjoy with your baby or toddler and creates colorful memories through painting, collage, clay sculpture, drawing, role-playing and other activities. On a daily basis toddlers get engaged in non-competitive interactive sports which emphasize confidence like football, basketball, racquet sports, and golf. A new Gourmet Experience. 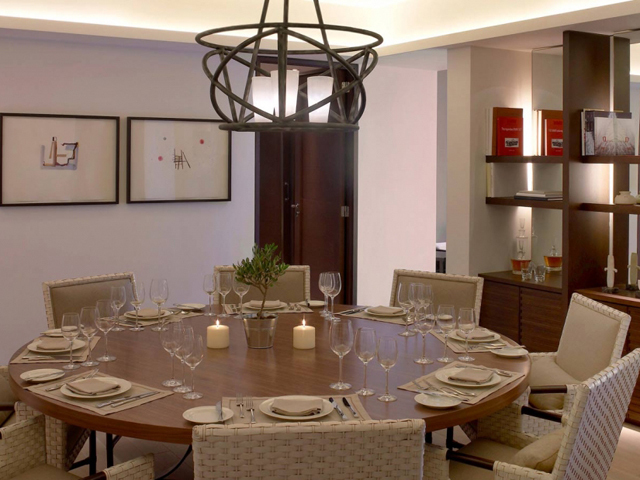 Offering an intriguing menu expertly designed by four-times Michelin-starred chef Andrea Fusco, this gourmet restaurant specializes in Italian and Mediterranean cuisine prepared with the freshest local ingredients. Contemporary and signature dishes from various regions, imaginatively interpreted with respect for tradition and a contemporary flair. Fresh fish, seafood and Greek culinary delights by chef Yorgos Papaioannou of Piraeus, acclaimed for the freshest fish and seafood specialties. 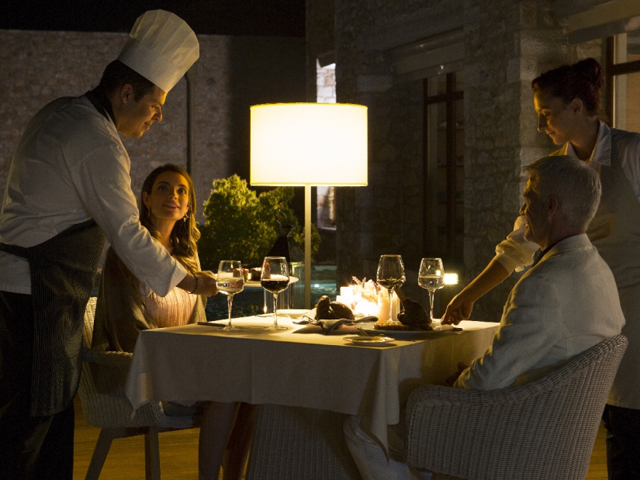 Sourced from local fishermen, combined with the best ingredients and accented with local herbs, vegetables and olive oil, Armyra offers a unique gastronomic experience. Taste dishes like lobster risotto, mussels with ginger, tuna tartare with ginger and bitter apple as well as fresh salads with kritamo, local cheese talagani and much more. A Greek quality dining concept. 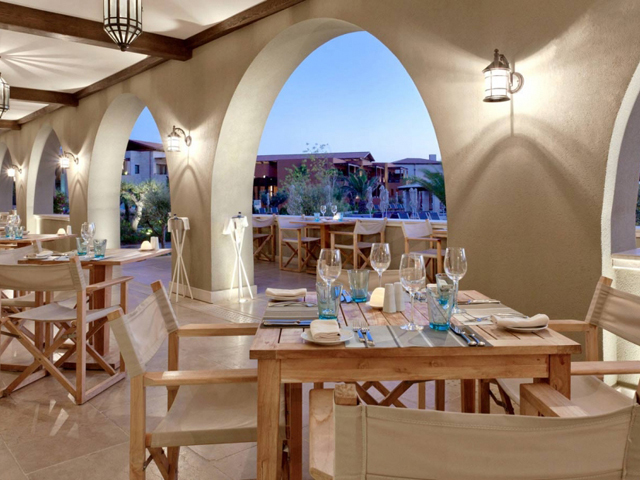 Discover authentic Greek flavors at “Taverna” restaurant, a casual quality dining concept based on simple homemade-style dishes, prepared with great care and pride. A culinary experience consisting from the freshest local produce found in the area and cooked with traditional Messinian and Greek recipes. 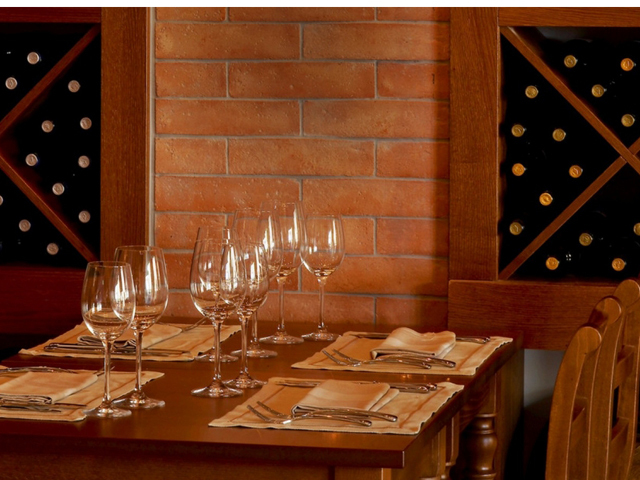 “Taverna”, simplicity at its best! Discover signature cuts. Classic and signature cuts, some exclusive, are served on large wooden platters, complemented by the freshest ingredients from carefully selected small-scale producers in the surrounding area. Many of the specialty herbs and vegetables are handpicked by our chefs, direct from the restaurant’s purpose-built gardens. An authentic Italian experience. From the Alps to Sicily, the creativity and diversity of Italian cuisine is vividly portrayed with an antipasti buffet, à la carte selections and traditional pizza-making. An Italian experience that can be combined with the time-honored Greek tradition of outdoor cinema, as you savor your meal while watching a film on the Agora Cinema screen. A classic American Diner. Experience the timeless appeal of a 1960’s-style American diner offering grilled favorites cooked to order and extra thick milkshakes. 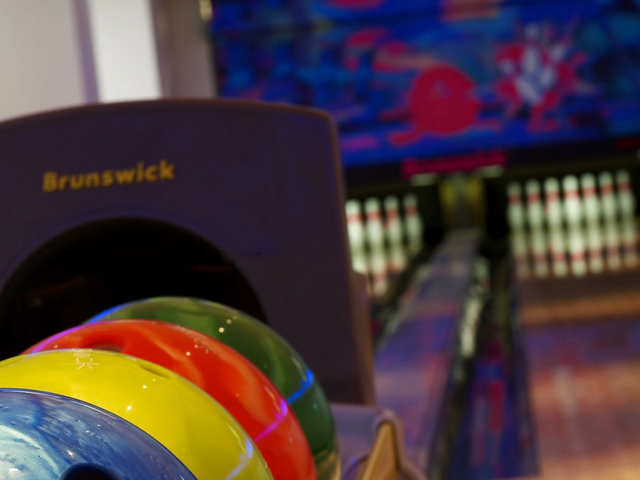 A full afternoon entertainment awaits in an authentic setting to the music of the rock-and-roll years, with ten-pin bowling, pool, video games and an indoor cinema. Traditional Greek souvlaki. Serving traditional Greek souvlaki wrapped in grilled pita bread with garnishes or threaded on small wooden skewers, accompanied by golden fries cooked in Messinian extra virgin olive oil and sprinkled with hand-picked oregano, plus a choice of favorite Greek dishes. The meeting point of the Agora. 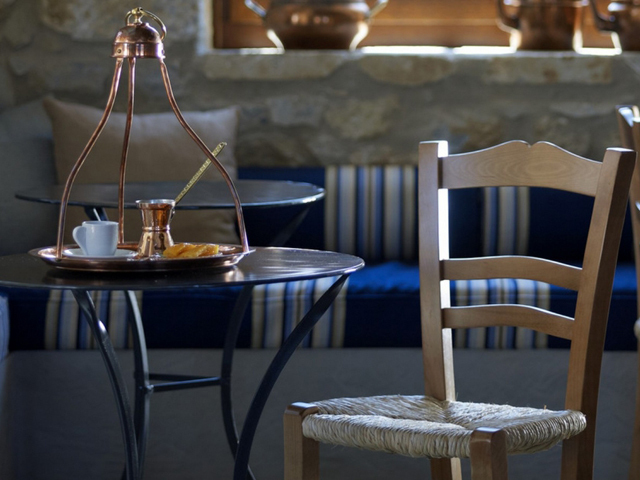 A fascinating new take on Greece’s time-honored coffee house culture, re-imagined as an all-day venue serving Messinian breakfast, traditional local meze with ouzo, light meals, regional pastries, along with a choice of locally produced cheeses and cold cuts. The offerings are further elevated by homemade pies, freshly baked each day by local women, while the Navarino Icons range of authentic food products and wines make a delicious and original gift for loved ones. 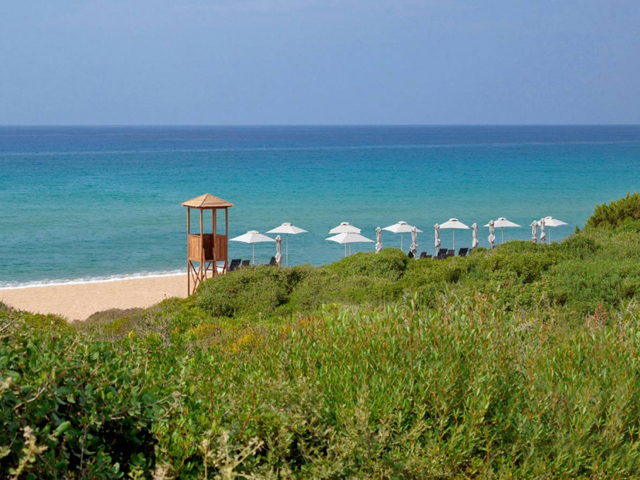 Enjoy freshly caught fish and tasteful snacks Located next to the crystal clear blue waters of Ionian Sea and on The Dunes Beach, Barbouni offers a wide selection of healthy sandwiches, freshly caught fish and tasteful snacks. 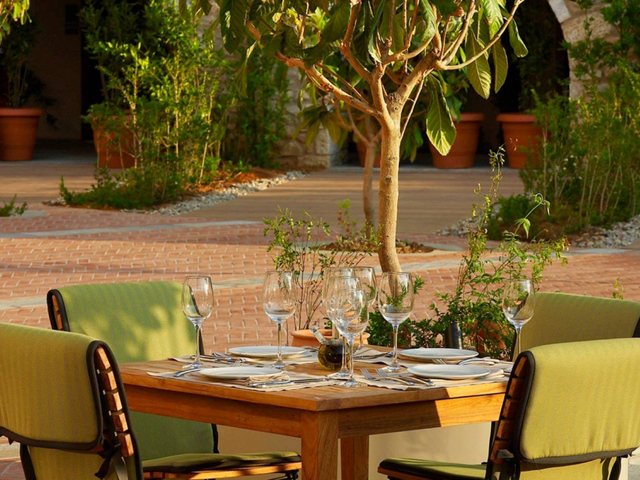 Enjoy delicious freshly caught fish complemented by chilled Greek wines or refreshments. A memorable BBQ experience. 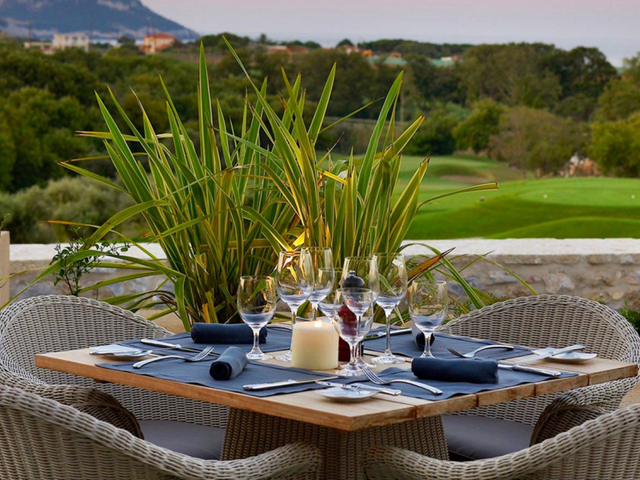 Surrounded by The Romanos Resort indigenous flora, our BBQ pits are ideal for friends and family dinners in utmost privacy. Under the attentive gaze of our Chefs, savor locally sourced organic meats and freshly caught fish cooked to perfection, accompanied by delicious sauces, dips and grilled baby vegetables freshly picked from our own garden. 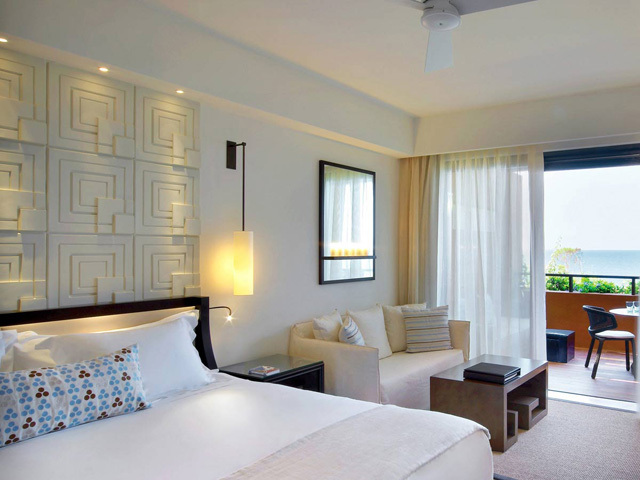 Deluxe Rooms: Our Deluxe Rooms capture a sophisticated marriage of modern style, timeless grace and authentic furnishings. 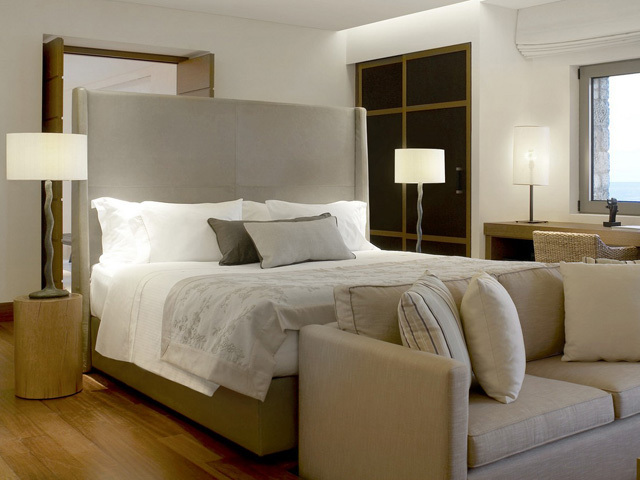 The décor embraces a warm contemporary palette, accented with cream marble anddark wood, together with linen fabric and 350 count thread sheets covering the signature Luxury Collection bed. 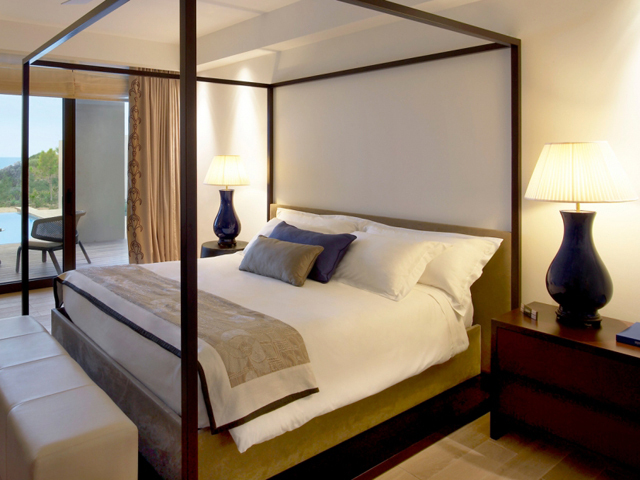 Kindly note that Deluxe Rooms are available in a choice of king or twin beds with various inter-connecting room types available upon request. 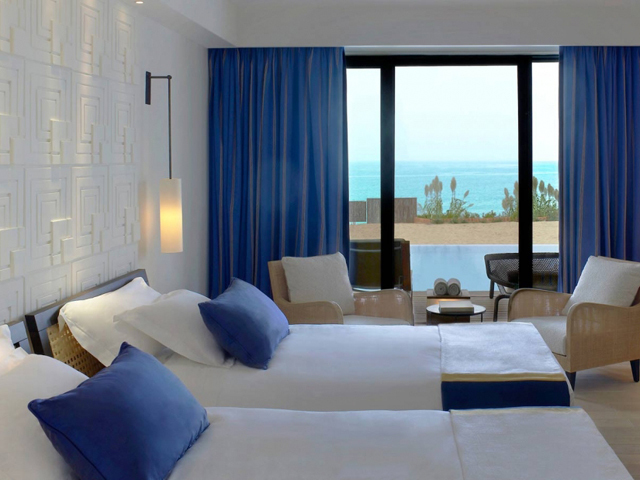 Deluxe Sea View Rooms : Our graceful Deluxe Sea View rooms boast panoramic floor to ceiling glass doors, leading onto private terraces, framing mixed views of the Ionian Sea over either The Dunes Golf Course or The Romanos pool deck. 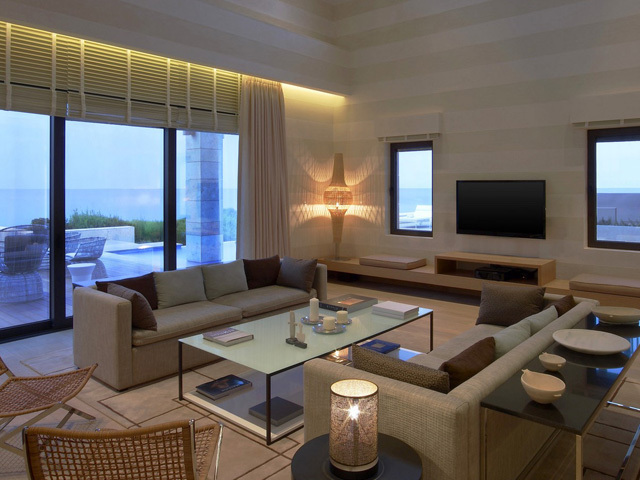 A bower of chic elegance, each room features a sofa and coffee table, a gracious desk by the window, artful detailing in cream marble and dark wood -all in a pleasing palette of refined taupe and sand. 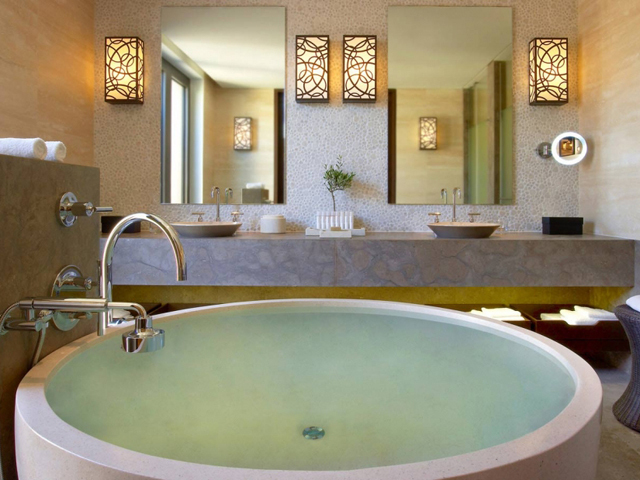 Infinity Rooms : Infinity rooms enjoy the comfortable facilities of Deluxe Rooms with the additional feature of a 23m2 individual infinity pool. 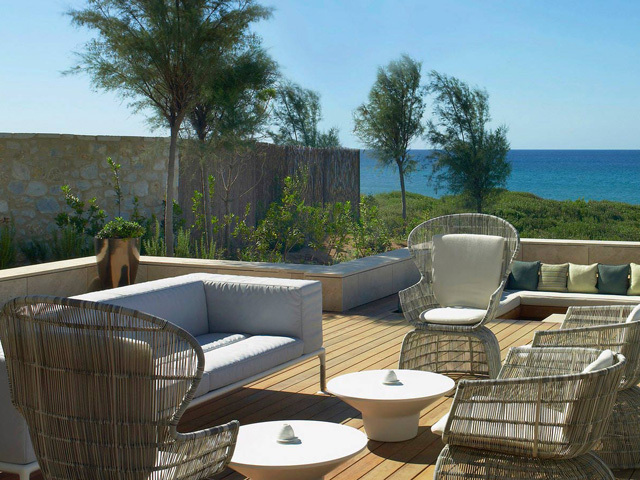 With direct access from your lavishly furnished wooden terraces, you may enjoy the Mediterranean sun under your own tranquility and set you mind free to the splendor of Navarino Dunes sunset. Premium Deluxe Rooms : Seafront located by The Dunes Beach, the Premium Deluxe Rooms enjoy enchanting views of the sparkling Ionian Sea, from their individual spacious terraces - just the ideal spot to savor a Luxury Collection signature cocktail, whilst soaking up the captivating Messinian sunset. 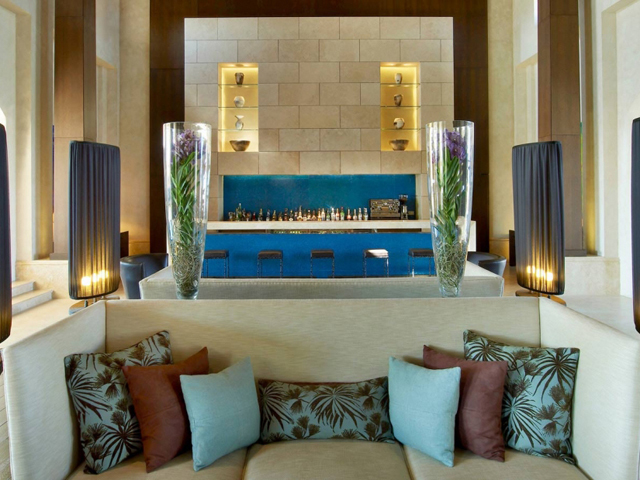 Incomparable interiors, contemporary stylish design and furnishings of cream marble and dark wood, and an alluring color palette of opulent textures, along with impeccable service and an exceptional range of exclusive services, deliver the epitome of elegant living. 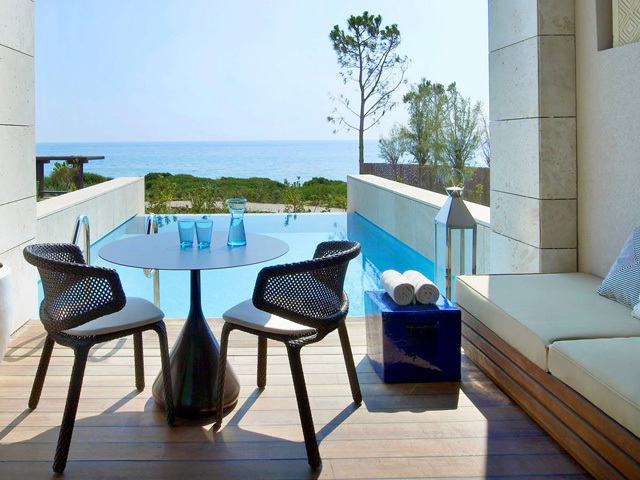 Premium Infinity Rooms : Located by The Dunes Beach, the seafront Premium Infinity Rooms feature an extensive terrace and a private pool, both set against the captivating views of the Ionian Sea. 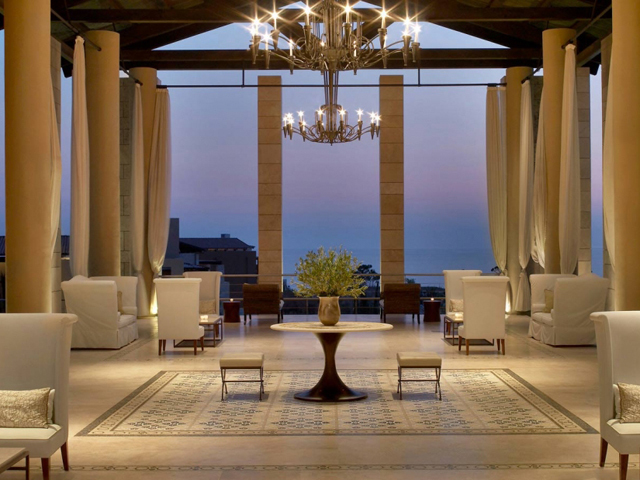 A revitalizing morning swim, and a Luxury Collection signature cocktail while soaking up the breathtaking Messinian sunset, will absolutely add an unforgettable touch to your stay. 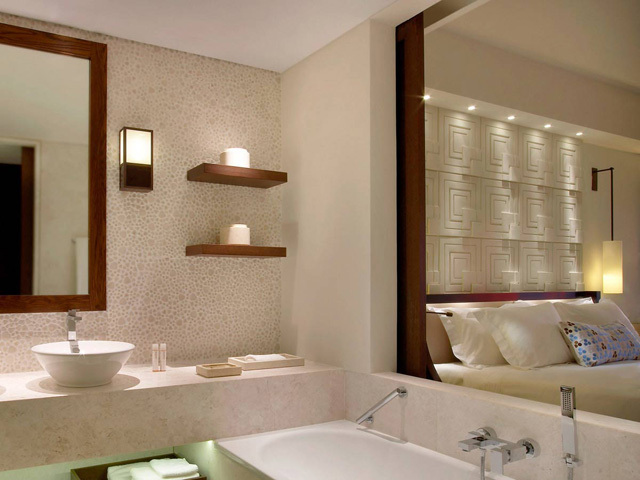 Incomparable interiors, contemporary stylish design and furnishings of cream marble and dark wood, and an alluring color palette of opulent textures, finest bathroom amenities, along with impeccable service and an exceptional range of exclusive services, deliver the epitome of elegant living. Ionian Exclusive Grand Suites : Spacious, with inviting views to the golf landscape or the lush resort gardens, the Ionian Exclusive Grand Suites feature a comfortable lounge space, accommodating a modern sofa, a dining area for four, and a state-of-the-art home-cinema system, as well as a contemporary style bedroom with an infinity bath tub set against the oversized bedroom window. 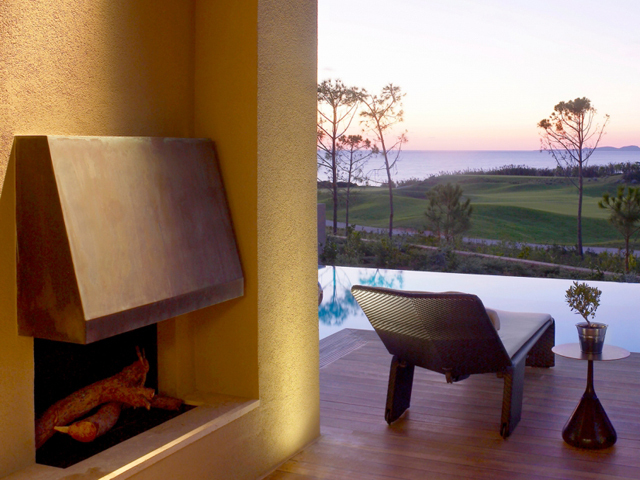 Experience refined luxury by the fireplace of the gracious suite terrace, soaking up the breeze and enchanting ambiance of Navarino Dunes, while savoring a Luxury Collection signature cocktail. Ionian Exclusive Grand Infinity Suites : Spacious, with engaging views over the resort gardens, the lush golf landscape, or the sea, the Ionian Exclusive Grand Infinity Suites feature a comfortable lounge space, accommodating a modern sofa, a dining area for four, and a state-of-the-art home-cinema system, as well as a contemporary style bedroom with an infinity bath tub set against the oversized bedroom window. Ionian Exclusive Grand Infinity Seaview Suites : With remarkable unobstructed views over the alluring Ionian Sea, these spacious, seafront suites feature a comfortable lounge space, accommodating a modern sofa, a dining area for four, and a state-of-the-art home-cinema system, as well as a contemporary style bedroom with an infinity bath tub set against the Navarino Bay. 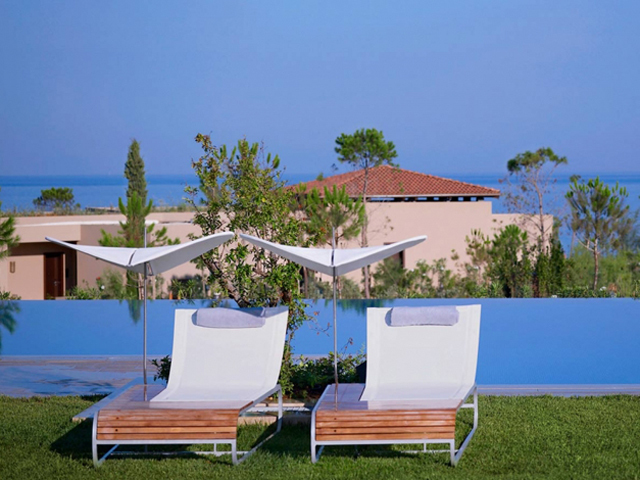 Master Infinity Villa : Offering exquisite location and absolute privacy, The Master Infinity Villas (142m2), enjoy the incomparable views of the Ionian Sea by The Dunes Beach. 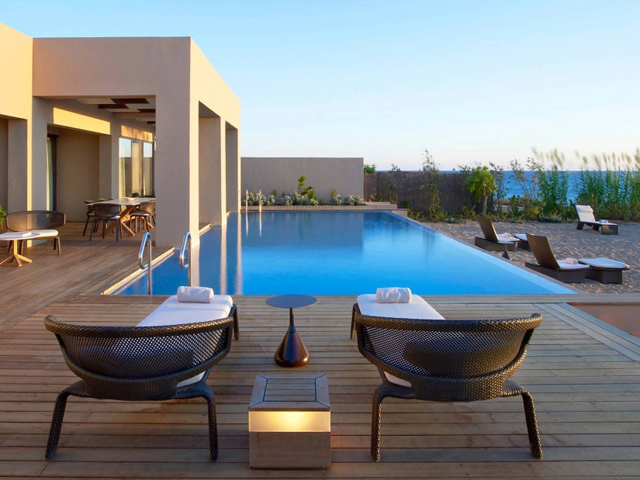 Located in the attractive beachfront of the resort, this one bedroom villa accommodates an exceptional terrace with daybeds surrounding the 48m2 infinity pool being the ideal place to relax and soak up the atmosphere of Costa Navarino in your own privacy. 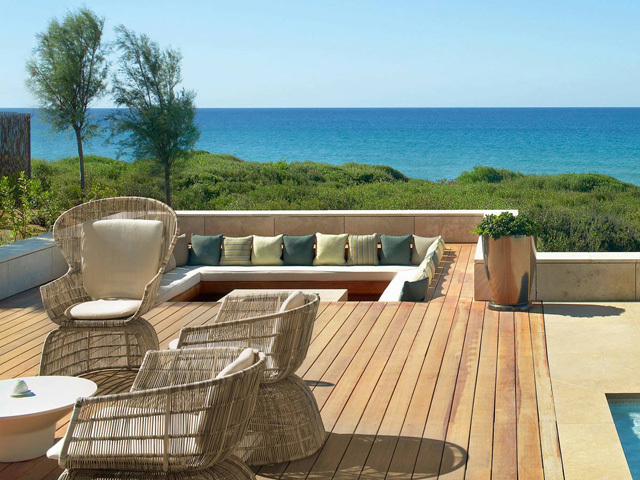 Ambassador Villas : Offering exquisite location and absolute privacy, the beachfront Ambassador Villas Ithomi & Sapientza, enjoy unobstructed views of the sparkling Ionian Sea, and direct access to the golden The Dunes Beach. These exquisite villas of 192m2 introduce the essence of palatial living with a master bedroom featuring a wooden four-poster signature Luxury Collection king-size bed, and a second bedroom with two twin Luxury Collection signature beds, all with lush 250-thread-count sheets, encased in pure Egyptian cotton, complimented by arctic down or hollow fiber pillows. 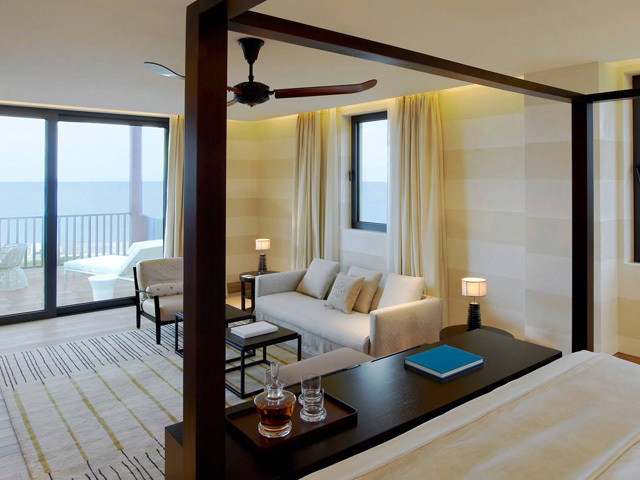 Light cream and brown colors, combined with a touch of blue, blend in perfect harmony with the azure sky and sea from the wide floor to ceiling windows. 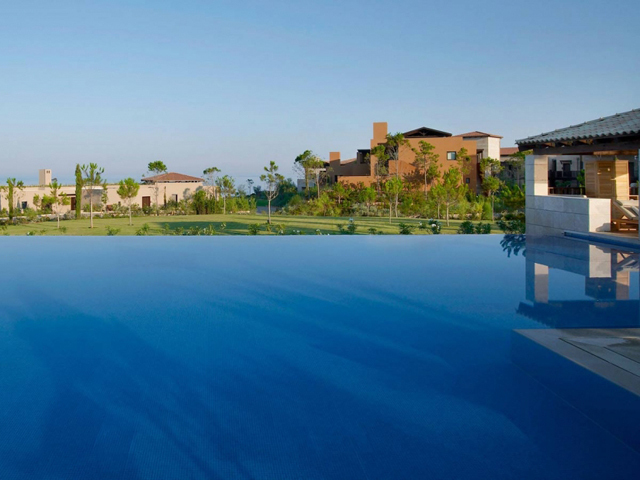 Royal Villa Methoni : Nestled between the sparkling sea and beautifully tended gardens, the Royal Villa Methoni stands regally just a short walk from the golden sand of The Dunes Beach. 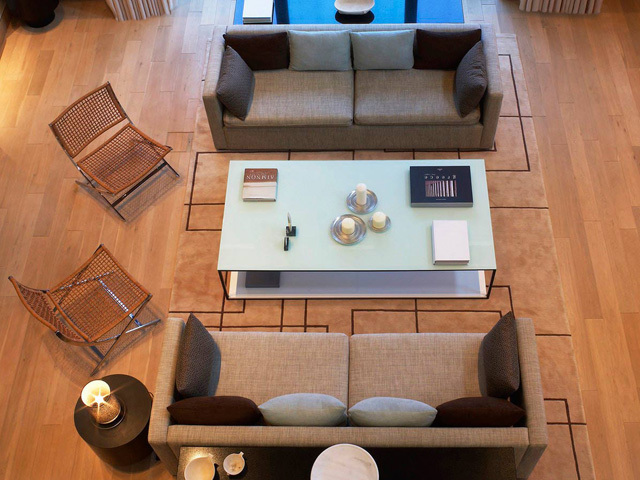 This grand three-bedroom residence with 630m2 of interior living space offers guests outstanding amenities and total privacy. 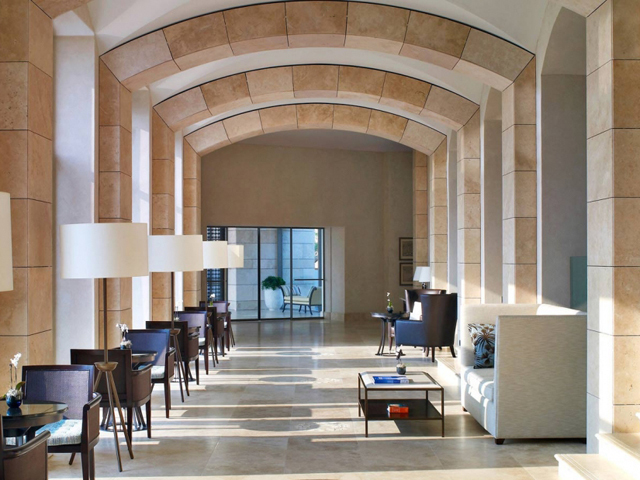 Built using native stone and incorporating traditional design elements, the exterior preserves the rich architectural heritage of the region’s master builders and blends harmoniously with the timeless landscape. 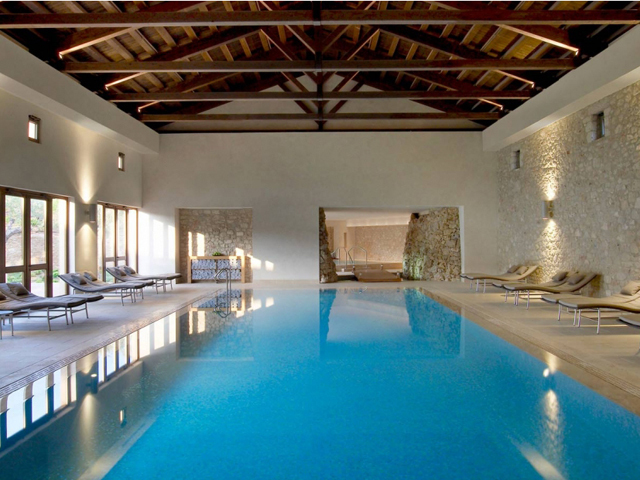 Royal Villa Koroni : The magnificent 660m² Royal Villa Koroni, at The Romanos Resort has been awarded with the prize of “Best Suite, Interior Design of the Year”, at the European Hotel Design Awards 2010. 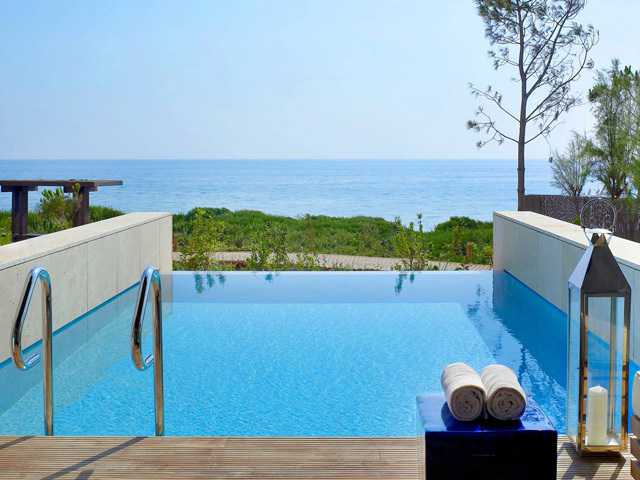 Offering unobstructed views of the Ionian Sea, Royal Villa Koroni creates a truly memorable stay. A three-bedroom residence, it benefits from its stunning natural setting, and offers complete privacy, in an environment of calmness and tranquility while in most cases is the top choice of our most distinguished guests. 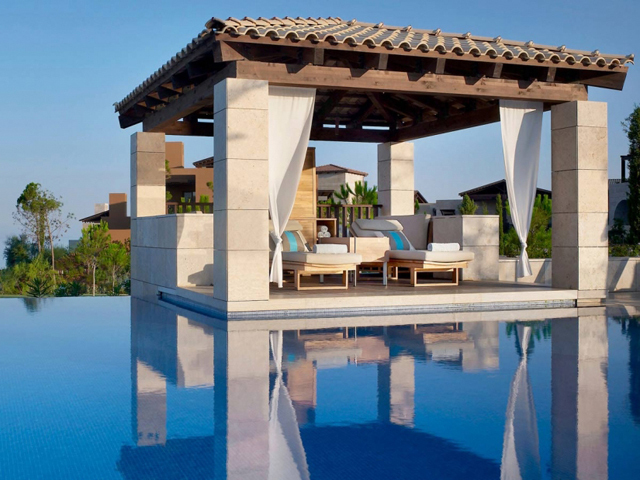 Located in pristine scenery of olive groves, indigenous trees and flora, by the coastline of The Dunes Beach, The Romanos Ionian Exclusive features an elite bouquet of beautifully appointed suites and villas, revealing exquisite, award-wining architecture, elegance and lavishness, under the alluring Messinian sky. Early Bird 2019 up to 35% Reduction !! LIMITED TIME 1! 01.09.19 - 29.09.19 !! Book Early and save up to 35% !! Free Cancellation !! 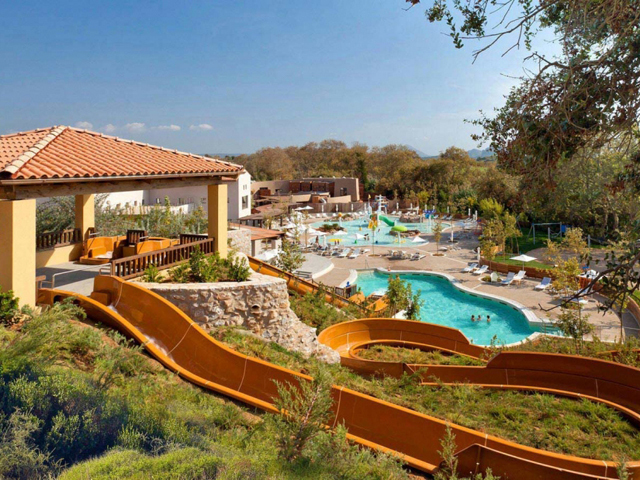 The Offer Is Valid For The Stay : 01.09.19 - 29.09.19 !! Book Now !! Limited Time Offer ! !